Navigation: Home » Personal Finance » How Much Did You Save in 2014? How Much Did You Save in 2014? Every year we like to post a couple articles directed inwards – we like to show, at least a few times a year, how we’re actually doing with the whole Personal Finance thing. By sharing our annual savings rate and our investment performance in the actively managed part of our portfolio, we hope it allows you readers to judge if we’re worth that precious spot in your RSS Feed, Twitter Feed or Inbox. So, again, like in past year – we hope you don’t see us as part of the “fake-it-’til-you-make-it” crowd; we actually practice most of the strategies we detail on this site… and not just the investment ones. How much did you save in 2014? We’re about to tell you how we did. 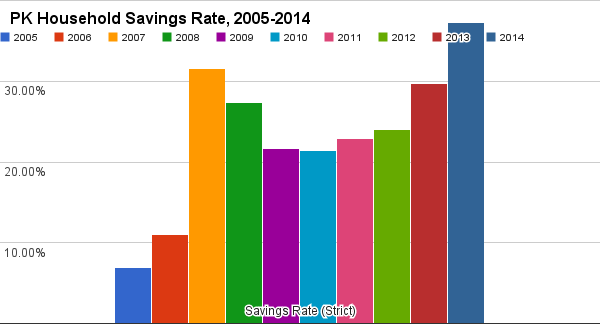 My household’s net savings rate for 2014 was 37.26%. Remember, controversially, we do not include principal paydown in our totals. If you do include principal paydown (as many of you prefer! ), my wife and I did even better: 46.21%. We will follow up with a piece on exactly how we came up with these numbers, but in essence… it’s best to do it around tax time. Make sure you add all sources of income; if whatever income number you are starting out with leaves out tax free interest, 401(k) matches/contributions, HSA, or whatever – add that back into your denominator, otherwise you will have an artificially high rate. As for a past retrospective, I only have savings rates numbers for the last decade, sorry – that’s all the information I could find by the time started caring enough about finance to be able to put this series together. Some transparency, huh? Like we said last year, our results depend on what benchmark you use when evaluating our savings rate. If you simply use something like the American overall savings rate – 5.8% as of February 2015 – then we did very well. So, too, for the calculators we made in 2013 for savings rates by age and by income. The income one is probably the most ‘fair’ to use (it’s already adjusted for tax) if you’re looking to compare, especially since a lot of the ‘age’ one is life cycle plus experience (and a consummate increase in earning power). The only place where we might come up short? Self-reported savings rates at other Personal Finance sites. So, again, how did your family do? What methodology do you use? How much do you hate our strict measurement? I have no idea what our savings rate was in 2014. But I can tell you that our net worth increased 76.1% (going from $103,012 to $181,364). 37% is a great savings rate, especially when you take into account that it excludes any pay own of principal. Excellent year over year results! I get a lot of complaints about my methodology, but I’m sticking to it, haha. My savings rate was crap in 2014 because I only really started working near the end. 🙂 That and SHOPPING! All kidding.. somewhat aside.. I am hoping my savings rate will be killer this year. Ha, you had other circumstances as well – don’t be too harsh on yourself. I’m sure you’ll put up a huge number this year. Just for you, I took another look at our taxes to give you the numbers. It kindof made me gag how close these numbers were to each other this year. Savings = roughly the rest = 54.5%. For us, gross income = job gross wages + rental EBITDA. 2015 will certainly be a lower percentage. Oh well. I’m with you – I count property taxes and sales taxes as part of spending. Excellent numbers – and even better if you add back the principal payments. I’ll have another post with more details on how I calculated my numbers (it probably isn’t totally clear). But, next, Cameron wants to give his a go. That is an amazing savings rate! We’re still working on ours, and I’m determined to do better this year. Wow 37% is an awesome savings rate! I never used to save at all and struggled financially until I came across Jim Rohn and followed his “70% spend, 10% invest, 10% charity and 10% saving” rule. Ha, well, if you’ve been doing 10% for a while your savings rate has been increasing at 1/10 the rate of your raises. More than most can say!